The holidays are here! ‘Tis the season to eat, drink and be merry. With parties and seasonal treats galore, many people resign themselves to putting on a few extra pounds, and figure they’ll just deal with it in a New Year’s resolution. But with a little pre-planning, you can enjoy yourself without adding to your waistline. Here are some ways you can stay on track during the holidays. Focus on fun, not food. Make social plans that aren’t focused on eating. Enjoy time with friends and family while going on a walk, visiting a museum, going to a basketball game, ice skating or holiday shopping. Out of sight, out of mind. Always store goodies out of sight. Never keep cookies, candy or other treats on the kitchen counter or table. After a holiday dinner or party, immediately freeze leftovers into portions. Don’t start a weight loss diet during the holidays. Focus instead on maintaining your weight. You can do this by carefully monitoring your portions, exercising regularly, and eating healthfully. Schedule your workouts early. Try to workout early in the morning to avoid schedule conflicts in your afternoon and evening. Keeping up your fitness routine will help you feel your best, as well as helping to curb extra pounds. Exercise also relieves stress, making it especially beneficial during this hectic time of year. Meal prep for success. With the hustle and bustle of the holidays, most of us don’t have time to cook a homemade meal every night. The temptation is to grab fast food on the go. Instead, cook one or two days a week – and use this time to prep several days’ worth of meals in advance so that you don’t have to cook on busy days. Use your slow cooker to make ahead stews, soups, and other nutritious one-pot meals. Keep fruit on hand for snacks. Think moderation, not deprivation. Limit portion size of high-calorie foods. Enjoy treats in moderation. You do not have to necessarily avoid eating holiday foods – just put a limit on the portion size. Make substitutions. It’s possible to alter your favorite holiday recipes to have less sugar or fat, by substituting some of the ingredients. For example, use low-fat sour cream in a dip, or add less sugar than the recipe may call for. In baking recipes, try replacing half the amount of butter or shortening in your recipe with unsweetened applesauce. Take a post-meal walk. After a big holiday dinner, you might say, “I’m going for a walk. Would anyone like to join me?” Chances are someone will. But if not, go alone. Learn to say no. Just because someone offers you food doesn’t mean you have to accept. You can politely say, “Thank you, it looks delicious, but I’m stuffed.” If they persist, ask if you could take some leftovers home instead. Traveling for the holidays? A long trip can be hard on the body, leaving you aching and tired. To feel your best, get out of the car and stretch every 1-2 hours. Don’t arrive hungry. Just as you’re not supposed to go grocery shopping on an empty stomach, the same is true for parties. Don’t avoid eating during the day in order to “save” the calories for later. If you do this, you’re more likely to overeat, because of hunger. Eat a healthy snack or light meal beforehand so that you’re not tempted to overindulge. 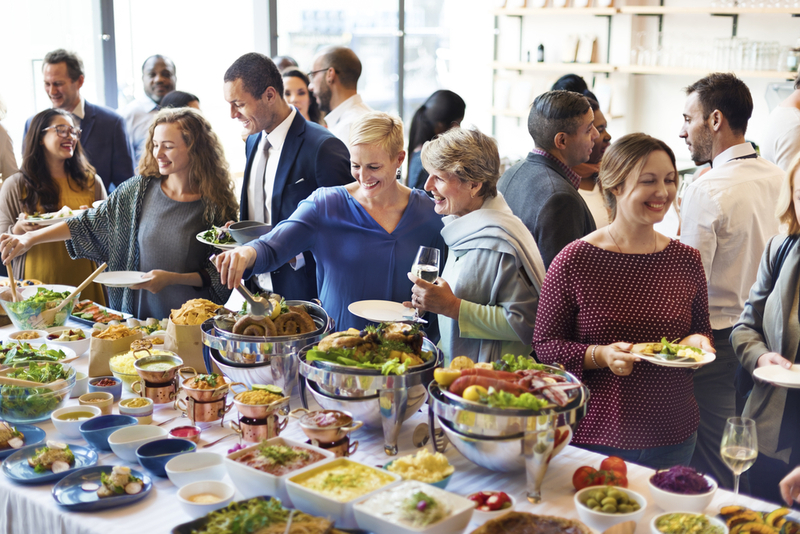 Bring a healthy dish to the potluck so that there is an alternative to items that are high in calories, fat or sugar. A fruit tray, salad with a light vinaigrette, whole wheat pita, and hummus, fresh veggies with a low-fat dip, grilled chicken tenders, low-fat cheese, and multi-grain crackers, or cocktail shrimp are all healthy, easy options. Rather than sampling every dish, enjoy a few of your favorites and forgo the rest. Fill half of your plate with vegetables. This can help fill you up and leave less room on the plate for the high-calorie items. Don’t hang out by the buffet table or bar at holiday parties. The more you see food and drinks, the more you’ll want them. Watch it with alcohol. If you choose to drink, be mindful of your serving sizes. Calories in drinks can add up quickly. Treat alcohol like a dessert. Ideally, limit yourself to one drink at most. As an alternative to alcohol, sip seltzer, flavored water or another low-calorie beverage instead. Holiday stress can affect your eating habits and your health, and lead to weight gain. During this busy season, it’s easy to forget about healthy eating, exercising and getting enough sleep. Exercise is a stress reliever, as well as a way to burn calories. If you aren’t able to commit much time to working out, try to get in at least 15-20 minutes of walking each day. Nutritious, healthy meals will help keep your energy up and feeling your best. It’s worth the time to pay attention to your diet and ensure you are getting regular meals and the nutrients your body needs. Avoid the trap of being over-scheduled. Don’t feel you have to accept all invitations. You have the right to politely decline. Protect your downtime, and prioritize your rest and relaxation. Treat yourself to a massage, a long bubble bath, or curl up with a good book. Remember, it’s not selfish to take care of yourself. A healthier, stronger, happier you is better able to care for those depending on you. Get back on track right away. If you happen to splurge at a holiday meal, don’t feel guilty. One day will not make or break you. Just be sure that one day of excess doesn’t turn into more. Allow yourself the holiday, and then get right back to your regular routine the next day. If you overdid it the entire holiday season, remember that it’s never too late to begin again. Recommit to exercise and nutrition now for a happy, healthy new year.